Computers are like air conditioners... they don't work if you open windows. Cement has better virus protection. that being said, using microsoft boxes as bricks is very eco friendly. Having Microsoft Windows is similar to having our freedom of speech whereas having a mac is like being owned by steve jobs. He is like your king forcing you to obey what he says. You can do this, you cannot do this. The only thing restricting you on a PC are the legal issues enforced by the law. I'm a PC man and will always remain so. I will admit though apple computers look nice and professional at a glimpse, although I can make my PC look just as good with versatility. The mac fanboys are out today it seems. I bought a mac just so I can install windows 7 on it, in your face apple!! On cement is where your Windows is going to end up. LOL windows fanboys talking about "no restrictions" xD LOLZ Seriously, you KNOW that Linux gives you MORE freedom than windz? You know? And now we know what Vista's made of. Firstly, as someone else said, they aren't in the same order, secondly, CE was mostly used on palmtops and POS (Point of Sale) systems, it wasn't meant to be a standalone operating system. Please tell me you guys saw "See me 'n teh workstation". 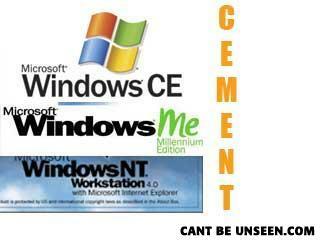 if you wanna play that game then CEMENT ftw! So....if this makes cement, that what are Macs? This is older than the internet. Why did Bob drop his ice cream?